There's something for every groomer, whether you are based locally, nationally or internationally. You will enjoy learning directly from a grooming expert who has achieved international acclaim, yet has lost none of the enthusiasm for passing on knowledge and skills to beginners and professionals alike. 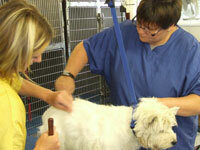 Discover how rewarding dog grooming can be! We are currently updating our courses. In the meantime please contact us via email or telephone for further information. Agnes started her grooming career at the London Academy of Grooming with Gill East. She operated successful grooming businesses for many years. During that time, she also completed a two-year vet nursing course at Glasgow Veterinary College. Scotgroom was started in 1999, and since then, Agnes has trained hundreds of groomers who have gone on to run successful businesses and compete nationally and internationally. Many groomers return for advice and assistance before sitting their exams, as Agnes was a City and Guilds Examiner for several years. Agnes has competed internationally and was a GroomTeam Scotland member in 1999 - London, UK; 2001 - Calgary, Canada; 2005 - Montpellier, France; and 2007 - Milan, Italy. Amongst the many grooming awards she has received are the Cardinal Crystal International Groomer of the Year 2004 at Intergroom, New Jersey, USA and International Gold medallist 2005. She has been on the judging team at Eurogroom Prague Best and Dublin. Her free time is spent showing and judging Standard, Miniature and Toy Poodles and various Gundog breeds with great success. Agnes holds a distinction pass in City and Guilds 7750 (now called the 7750-03 Advanced Certificate in Dog Grooming) and the Advanced Grooming Diploma (now called the Higher Diploma in Dog Grooming). She holds the LCGI Licentiateship award in dog grooming, recognising her as a master craftsman in Europe. This is the highest award achievable in dog grooming. She is also a member of the Guild of Master Groomers and the Cardinal Crystal Academy. Other qualifications include units in Training and Development and a Further Education Adult Teaching Certificate. Agnes's grooming ability is also recognised and featured in two of The Styling Academy's series of dog grooming DVD's. Both are available from Technogroom and show groomers and owners how to groom from start to finish. Christine: After a successful career with Motorola in their equipment maintenance department, Christine decided to embark on a major career change. In 2003 she started a training course at Scotgroom, but after the second day decided that dog grooming was not for her! Her husband persuaded her to continue with the course and, by the end of it, Agnes made her an offer she couldn't refuse! Christine's interest in dogs started at a very early age, but her parents were not keen to allow her to have one. After training her rabbit to do a perfect sit/stay/recall and a homemade agility course, her parents gave in and she eventually got her first dog, a Labrador. Several Border Collies followed and her involvement in competition agility, working trials and obedience training grew. Now she has Australian Shepherd Dogs and has added breed showing to her list of interests, with her first Aussie, Armatan Angel Eyes, going Best of Breed at Crufts 2005. Christine deals with administration and bookings. 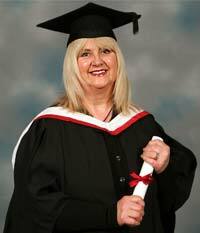 She holds a Distinction Pass in the City & Guilds Level 3 Certificate. Please call 01555 770333 if you would like to discuss training dates, or have tuition requirements not covered by the courses listed above. Note, we are open for business on Mondays to Thursdays only, so please leave a message on our answering machine and we'll call you back as soon as we can.